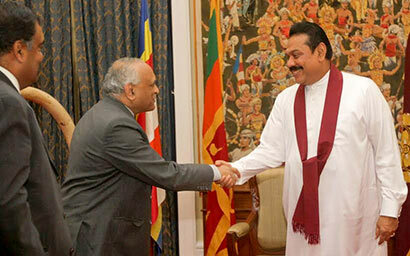 Indian Defence Secretary Mr. R.K. Mathur made a courtesy call on President Mahinda Rajapaksa at the President’s House in Kandy this morning. Expanding training opportunities, issues related to fishermen, overall defence related matters concerning both countries were discussed between the President and Indian Defence Secretary when he met the President. 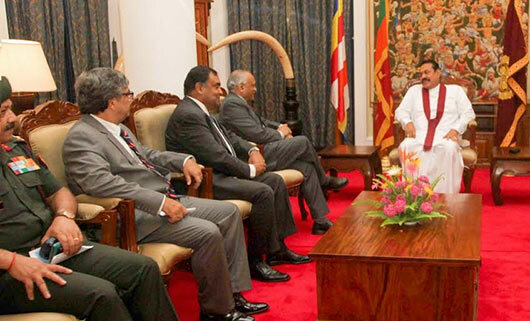 President Rajapaksa emphasied that he has continuously maintained that cooperation between Sri Lanka and India in the sector of defence which is an important aspect of the strong friendship shared by the two South Asian neighbours. The Indian High Commissioner in Sri Lanka Mr. Y.K. Sinha, Joint Secretary of India’s Ministry of Defence Mr. Ram Suhag Singh and Joint Secretary of India’s Ministry of External Affairs Mrs. Suchitra Durai, Secretary to the Ministry of External Affairs Mrs. Kshenuka Seneviratne and Commander of the Sri Lanka Navy Vice Admiral Jayantha Perera were also present. Meanwhile the second Annual Defence Dialogue (ADD) between the Defence Secretaries of India and Sri Lanka was held in Colombo on 09 October 2014. Defence Secretary, Shri R.K. Mathur and the Sri Lankan Defence Secretary, Mr. Gotabaya Rajapaksa co-chaired the meeting along with their delegations, comprising officers from the Defence Ministries, External Affairs Ministries and the Armed Forces of both the countries. During the dialogue, various ongoing defence cooperation initiatives were jointly reviewed and new avenues for cooperation identified. The regional security situation and issues of maritime security were also discussed at the meeting. The inaugural Annual Defence Dialogue was held at New Delhi on 31 January 2012.